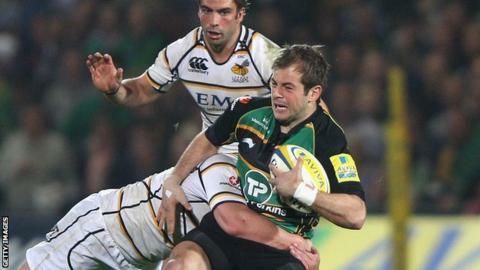 Stephen Myler and James Wilson inspired Northampton to victory over Wasps to go back to the top of the Premiership. Wilson, who spent eight years with provincial side Southland, put Saints ahead inside five minutes. Myler kicked nine points in the opening period while Wasps fly-half Nick Robinson landed two penalties as the hosts led 14-6 at half-time. Wilson went over for a second time after the break and Myler then took his tally 14 points to secure the win. After an early spell of pressure from Wasps, the home side went ahead after a great break from Ken Pisi sent Wilson over for his first try for the Saints. Myler missed the conversion and also a penalty attempt a couple of minutes later, but was accurate soon after to kick his first three points of the night. A successful penalty from Robinson put the first points on the board for the visitors, who then lost debutant James Bailey as he was taken off with a suspected broken leg. Robinson's second penalty closed the gap to two points, but Myler's 42-metre kick was followed by his third successful penalty to put Northampton further ahead. Wasps' Tim Payne, in his 250th match, was sin-binned just before the break. The TMO was called on and replays showed Payne dropping his knee on Vasily Artemyev. Myler missed the resultant penalty and the hosts led by eight points at half-time. Northampton lock Christian Day became the second player to be carried from the field on a stretcher with a shin injury, but the Saints stretched their lead when Wilson twisted on the line for his second try of the night, with Myler kicking the extras. Myler's fourth penalty was the last score of the night as the Saints continued their 100% winning start to the Premiership season. "The full 80 minutes was controlled. We can be a bit more accurate but our defence was very, very good and that was a big improvement from last week. "Wasps are a very improved side from last year. "We're delighted with how James Wilson has come in and played. He's made that full-back shirt his own. "We did think we could win five out of five. It's great to be here." Northampton: Wilson, K. Pisi, Waldouck, Burrell, Artemyev, Myler, Dickson, Tonga'uiha, Hartley, Doran-Jones, Manoa, Day, Lawes, Wood, Oakley. Replacements: May for Burrell (61), Roberts for Dickson (68), Waller for Tonga'uiha (73), Mujati for Doran-Jones (49), Sorenson for Day (54), Dowson for Lawes (61). Not Used: Haywood, Lamb. Wasps: T. Bell, Wade, Masi, C. Bell, Bailey, Robinson, Simpson, Payne, Lindsay, Taulafo, Palmer, Wentzel, Launchbury, Haskell, Vunipola. Replacements: Daly for Bailey (17), L. Thomas for Robinson (71), Davies for Simpson (68), McIntyre for Payne (57), T. Thomas for Lindsay (62), Staibano for Taulafo (64), Cannon for Wentzel (70), S. Jones for Vunipola (64).